Ley lines are believed by many people to be a series of metaphysical connections that link a number of sacred sites around the world. Essentially, these lines form a sort of grid or matrix and are composed of the earth's natural energies. "You won't find ley lines discussed in geography or geology textbooks because they aren't real, actual, measurable things... scientists can find no evidence of these ley lines–they cannot be detected by magnetometers or any other scientific device." Ley lines were first suggested to the general public by an amateur archaeologist named Alfred Watkins in the early 1920s. Watkins was out wandering around one day in Herefordshire and noticed that many of the local footpaths connected the surrounding hilltops in a straight line. After looking at a map, he saw a pattern of alignment. 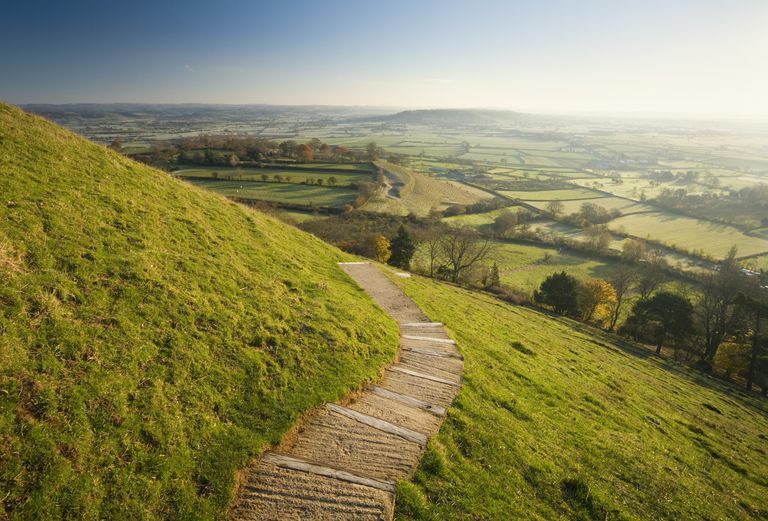 He posited that in ancient times, Britain had been crossed by a network of straight travel routes, using various hilltops and other physical features as landmarks, needed in order to navigate the once densely-forested countryside. His book, The Old Straight Track, was a bit of a hit in England's metaphysical community, although archaeologists dismissed it as a bunch of puffery. Watkins' ideas weren't exactly new. Some fifty years before Watkins, William Henry Black theorized that geometric lines connected monuments all over western Europe. In 1870, Black spoke about "grand geometrical lines across the country." "Two British dowsers, Captain Robert Boothby and Reginald Smith of the British Museum have linked the appearance of ley-lines with underground streams, and magnetic currents. Ley-spotter / Dowser Underwood conducted various investigations and claimed that crossings of ‘negative’ water lines and positive aquastats explain why certain sites were chosen as holy. He found so many of these ‘double lines’ on sacred sites that he named them ‘holy lines.’"
The idea of ley lines as magical, mystical alignments is a fairly modern one. One school of thought believes that these lines carry positive or negative energy. It is also believed that where two or more lines converge, you have a place of great power and energy. It is believed that many well-known sacred sites, such as Stonehenge, Glastonbury Tor, Sedona, and Machu Picchu sit at the convergence of several lines. Some people believe that you can detect a ley line by several metaphysical means, such as the use of a pendulum or by using dowsing rods. "On a regional and local level, it's anyone's game: how big a hill counts as an important hill? Which wells are old enough or important enough? By selectively choosing which data points to include or omit, a person can come up with any pattern he or she wishes to find." There are a number of academics who dismiss the concept of ley lines, pointing out that geographic alignment doesn't necessarily make the connection magical. After all, the shortest distance between two points is always a straight line, so it would make sense for some of these places to be connected by a straight path. On the other hand, when our ancestors were navigating over rivers, around forests, and up hills, a straight line might not have actually been the best path to follow. It is also possible that because of the sheer number of ancient sites in Britain, that the "alignments" are simply chance coincidence. Historians, who generally avoid the metaphysical and focus on facts, say that a lot of these significant sites were placed where they are because of purely practical reasons. Access to building materials and transportation features, such as flat terrain and moving water, were probably a more likely reason for their locations. In addition, many of these sacred places are natural features. Sites like Ayers Rock or Sedona were not man-made; they simple are where they are, and ancient builders couldn't have known about the existence of other sites in order to deliberately build new monuments in a way that intersected with existing natural sites.